1) Scott began his message by stating that he wants to be an encouragement to people by telling them how he feels about them before they are gone. Sadly, as he observed, many of us wait to say kind things about one another after someone has passed away. Who can you reach out to and encourage or thank for their leadership in you life? What about their lives and leadership example stands out to you? 2) What do you think it means to leave a godly legacy? Practically speaking, how can you leave a godly legacy to your kids, neighbors and/or coworkers? 3) What is God’s blueprint for church leadership? What passages speak to the role and responsibilities of an elder? 4) According to the Bible, what character qualities are to distinguish elders? Which of these character qualities do you need to grow in to improve your leadership? How can this group help you grow in this area? 5) Why do you think the Lord uses the image of a shepherd when speaking of church elders? What is it about a shepherds responsibilities that makes this a powerful comparison? 6) Take the time today to pray for the elders of Watermark. (See the Watermark News for how you can pray specifically for each elder). Find out more information on the elders at Watermark check out this post and be sure to leave a comment with any questions you may have below. 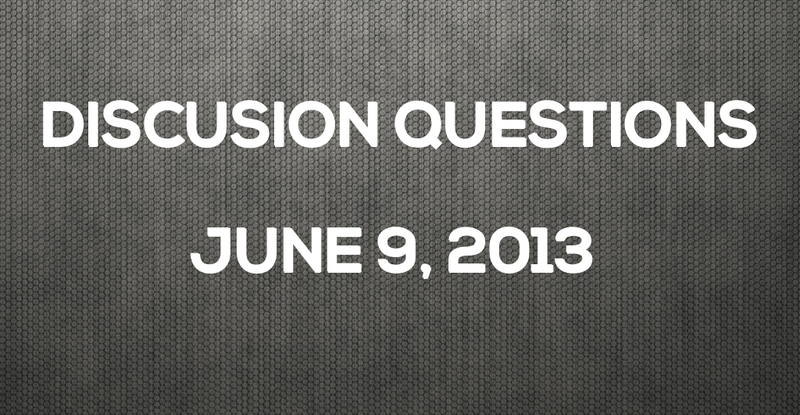 The post Discussion Questions: June 9, 2013 appeared first on Watermark Community Church Blog.